Hello again. I just thought I would show you another sneaky peak for Sheena. Don't forget to tune in to Create and Craft on Monday at 9am and 3pm to see the lady herself showing you some fantastic demos. This is another box of mine. The box is painted in emulsion and then the edges distressed with Broken China. The stamps a from Sheena's Little Bit Festive range. The images are stamped and then embossed. A bit of masking had to take place to extend the village scene, and then the whole image was coloured using H2O's. the snow at the bottom of the image is acrylic paint, and glitter was added to the mistletoe. A greeting was added and some snowflakes were die cut and ace behind the greeting. Some holly was stamped and coloured with H2O's and then added using 3d glue. Some clear gems were added around the edge of the lid. 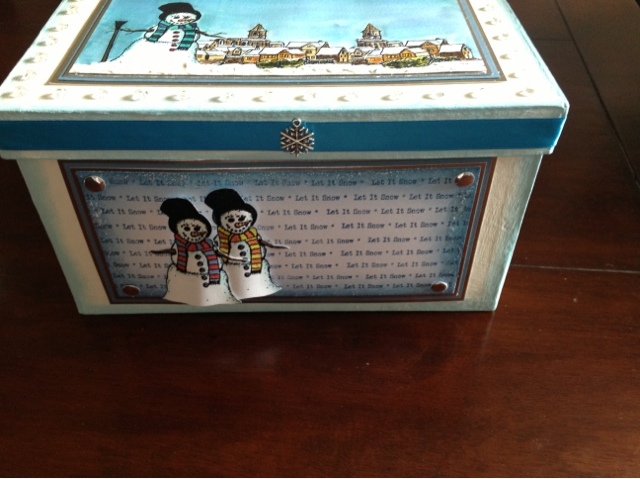 Ribbons and an embellishment were added around the side of the lid. 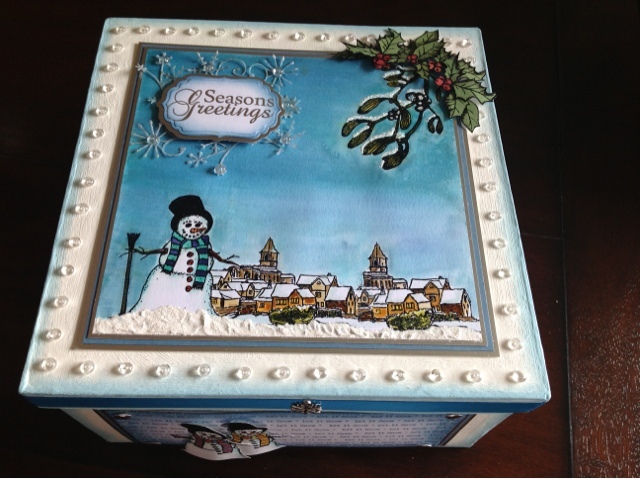 Around all four sides of the box the "Let it snow"stamp was stamped in Broken China, and the sides distressed. Two snowmen were stamped, embossed and coloured in H2O's and added. I hope you all like this box, as it was a challenge.